What are the different types of green roofs? 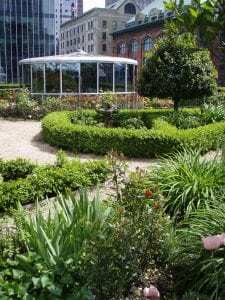 What is the history of green roofs? How do climate and geography affect green roof performance? 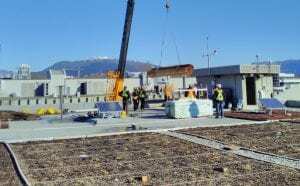 How do green roofs interact with photovoltaic Panels? How can I determine if an existing building will support a green roof? As cities become denser and food prices continue to rise, urban agriculture is a crucial element for happy people and healthy cities. One of the projects on the Elevated Lab involves a collaboration with the head chefs of BCIT campus. 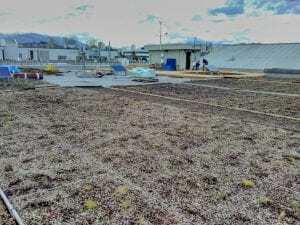 Just as they are interested in growing fresh produce and herbs for their Friday menus, we are interested in making that happen on a roof that has minimal loading capacity. This is unfolding as this blog post is written, so stay tuned to see how it unfolds! In the meantime, Christine gave an interview with CKNW about the Future of Farming, as part of their series on the Future of Work. Listen to it here. Both the Vancouver Food Charter and the Greenest City Action Plan call for a coordinated food strategy. Indeed, Goal No. 10 of the ‘Greenest City Action Plan’ calls for Vancouver to become a global leader in urban food systems. The overall local food target is to increase city and neighbourhood food assets — community gardens, urban farms, farmers markets, food processing infrastructure, community composting facilities, neighbourhood food networks — by 50% by 2020. 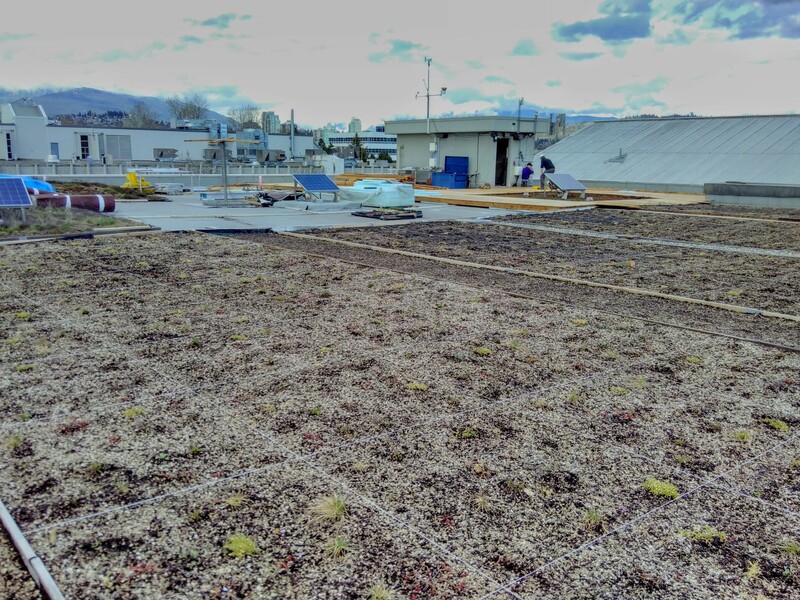 One of the first green roofs in downtown Vancouver, at Fairmont Waterfront, is in fact a roof garden. Since 1996, the ARC Restaurant has been growing herbs, vegetables, fruits and edible blossoms for their menus. Everything is organic. In addition to herbs like rosemary, lavender, bay leaves, and tarragon, the 2100 square foot garden grows garlic, kale, leeks, rainbow chard, carrots, peppers, green onions, strawberries, pumpkins and apples. Since 2008, the garden also hosts honeybees. Since 2015, this has grown to include four beehives with over 250,000 honeybees producing 125 lbs of honey on site. It’s spring time in BC, which means the Elevated Lab is nearing completion! The deck was installed this week, which is very exciting as it now makes access to the roof a truly beautiful experience. This installation also means the green roof is nearing its intended potential, as a living lab that serves for learning, research and demonstration. Once the safety railing are installed, the Elevated Lab will be open for business! The Elevated Lab project is blessed by the support of many in-school collaborators. In the case of the deck, Carpentry students prepared the deck frame in January, under the guidance of Faculty who designed and have now installed it. Many thanks to Don, Derek and Gary from Carpentry, and all their students for helping to make this vision a reality. 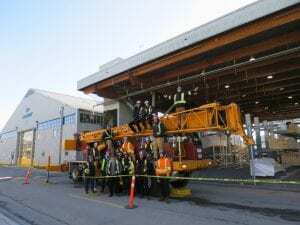 The deck would not have been possible without our collaborative supporters in the Steel Trades, either, who hoisted the materials up in February. Twenty-five students of the Ironworker Generalist Apprentice Level 1 program got ‘real world practice’ hoisting materials onto and off the green roof. Thanks to everyone who was involved there, including our faculty colleagues Mike, Art and Kevin. There is still much to come on north side of the roof, including food-growing planters, a small bog garden (with carniverous plants! ), a smudge circle for First Nations ceremonies, perches for birds and nesting boxes for Mason bees. Stay tuned! At BCIT Burnaby campus, dawn and dusk feature the regionally phenomenal ‘crow hour’. It’s like a sociable happy hour, for crows. 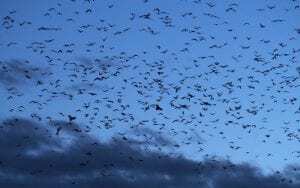 Thousands of birds descend onto the campus grounds in a dynamic flux of movement and noise, their large numbers covering every surface: parking lots, trees, lawns, power lines, roofs. When they arrive to Burnaby in the evening, the arrival is like a watershed of birds that seems to have no end. The source/ destination of this watershed is the roost at Still Creek, near Willingdon just north of Hwy 1. 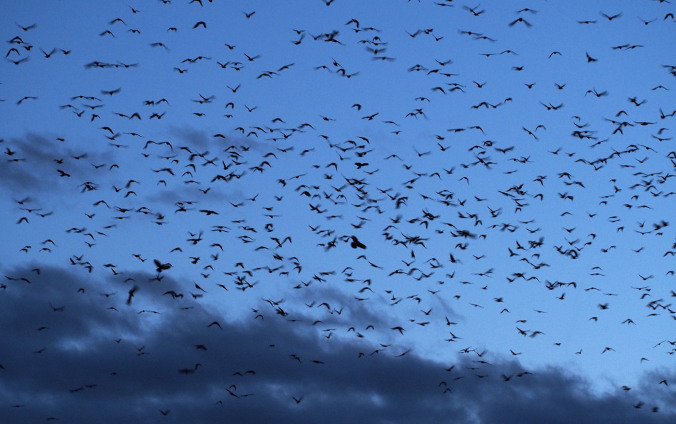 And when the birds leave in the morning, the west-bound flow gradually splinters from this source into small tributaries, or clans, and eventually into small family groups, who then spend the day together at their preferred locations on the coast before heading back to the communal roost for the night. Being an urban ecologist, and a designer of green roofs for biodiversity, or living roofs, I have been challenged by these birds. This blog post explores my experiences with the Burnaby crows with relation to my work at the Centre for Architectural Ecology. It also serves as a precursor to an essay I’ve been invited to write for The Nature of Cities (a collective blog for trans- disciplinary dialogue on ‘cities as ecosystems’). It seems most discussion about birds in the city refers predominantly to desirable birds, which we want to encourage more of. By contrast, discussion about ‘nuisance’ birds that cause us grief is relegated to commercial enterprises specialised in keeping them at bay. 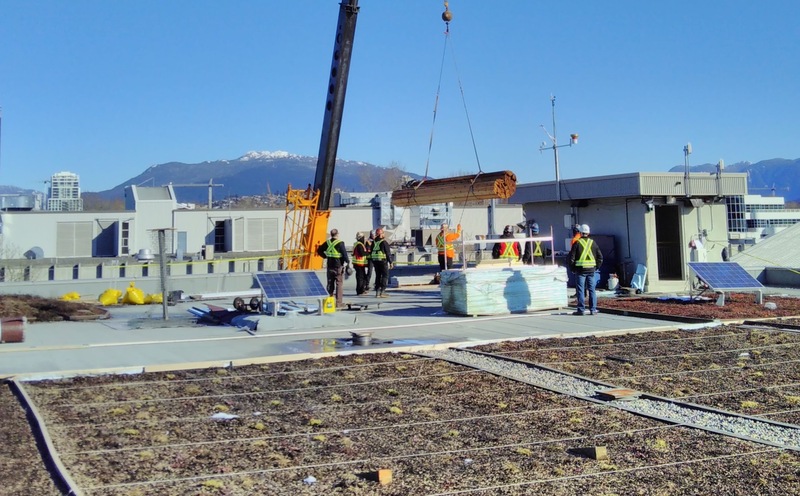 Over two glorious days in November, a crew of volunteers helped to plant BCIT’s newest green roof experiment on the Elevated Lab. Following a pre-randomised experimental design, 4,800 plugs and bulbs were planted into designated spaces across 240 plots of 1m2 each. It was a lot of work to ensure that the plants were placed as specified by the design. We finished at dusk on the second day, and I was ecstatic. My blissful state of accomplishment was soon replaced by despair, however, as the crows undid our work each day. 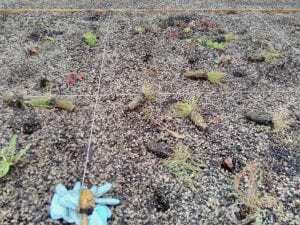 I was on the roof a couple hours every week, re-planting the damage. I had hoped for the best, but now realised how meagre “hope” can be in face of the reality. I had actually toyed with getting some form of bird protection in the months prior. We hadn’t budgeted for this, however, and I don’t like bird netting, which seemed like the only option. The challenge was not in the re-planting (however upsetting that was). Rather, it was in the experience of coming up against the limit of the feel-good narrative about green roofs and urban ecology. On the one hand, I would say that “green roofs provide habitat for insects and birds” but now with the exclusion clause: “except for crows”. I was confronted with a major flaw in my narrative, and one that felt hypocritical and skewed. What to do? With some reflection and discussion, the issue became clear. I want the plants on the roof to establish successfully. I also want to regard the crows with admiration and affection, not with anxiety and loathing. That meant that something had to be done about the birds, particularly during the establishment period. Dave Harper helped me set up a wildlife camera to determine with certainty who the culprits were, and what their patterns were. 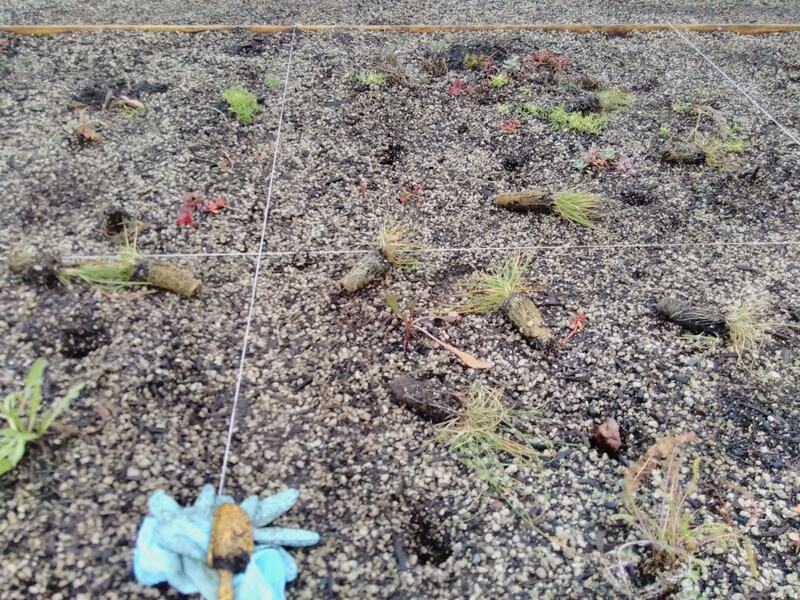 Following this and other conversations with colleagues from the BCIT Rivers Institute and the Ecological Restoration program, as well as the green roof industry, I investigated more seriously into the range of available bird deterrent systems. Crows are highly intelligent, and can figure something out in a matter of days, which is why scarecrows don’t work. Before the holidays, we decided to invest in a multi-sensory system of random lasers and a sound system. The lasers are similar to what many people installed around their homes for the Christmas period. Apparently birds have a strong aversion to such lights. The sound system features a number of bird calls that make birds uneasy. The sounds selected include the call of a predatory bird (peregrine falcon) and distress calls by raven and crow. Taken together, this multi-sensory system should make this area of BCIT campus less attractive for birds. Keep your ears open if you are on Smith St. between the hours of 7-9:00, 13-13:30, or 15-17:00. Depending on the random allocation of calls during these time-frames, you may hear the piercing call of a peregrine falcon, or the distress calls of ravens and crows. If you hear these calls, look around and observe the responses of whatever birds are around. This has been a neat test of co-existence, and a poignant opportunity to explore respect for self and other (i.e., respect for the project and for my well-being, and respect for the birds). It was also fascinating from a philosophical and professional perspective. I feel as though I’ve touched a fault in the bedrock between biophilia and biophobia. Whereas biophilia (‘love of life’) is a popular meme for urban and ecological design, rarely is biophobia addressed. Perhaps it’s easier to pretend the rats and other ‘undesirables’ don’t exist. This experience posed a reality check on the consistency of my narrative with regards to urban wildlife and green roof ecology, and I’m grateful to the crows for showing me up. We’ll offer GROW 1000 again in January 2019, as well as our 12-hour green wall course GROW 1500. Both courses are perfect for professionals, planners and students of all sorts. 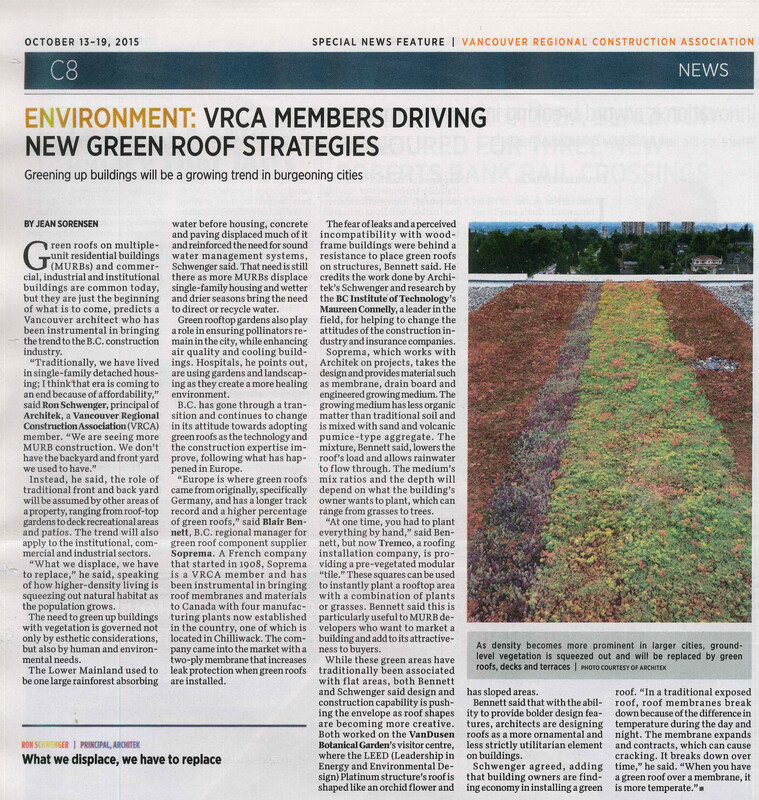 With the City of Vancouver developing a green roof policy, now’s a perfect time to refresh your understanding about these multi-functional technologies. Stay tuned for our spring line-up of courses, which will include the follow-on GROW 2000 as well as our newest course, GROW 3000. Tip: You are welcome to download the image to read in full size if you have trouble seeing the text. We have a sizeable reservoir of lovely plants in the lab that have been selected for green wall planting. They were prepared for student projects that involve living wall research. These include: golden pothos, brake fern, fern, pilea, spider plant, ficus. It’s quite wonderful to walk into a work space that showers down filtered sun from double-story windows and be greeted by an ocean of green. Most of these plants take quite a lot of tender loving care, except the spider plants and the pothos. Get up-to-speed on green roofs in our next round of GROW courses! Delivered over three Saturdays in May, now is the perfect time for GROW 2000, with its emphasis on plants and biodiversity. The course can be adapted to your learning needs, so don't worry if you lack the prerequisite. Register today! In spring 2018, the Centre launched two major projects on the Elevated Lab. One is the ‘learning classroom’ that features decking, railings and irrigation supplied by collaborations with our colleagues and students from the trades. 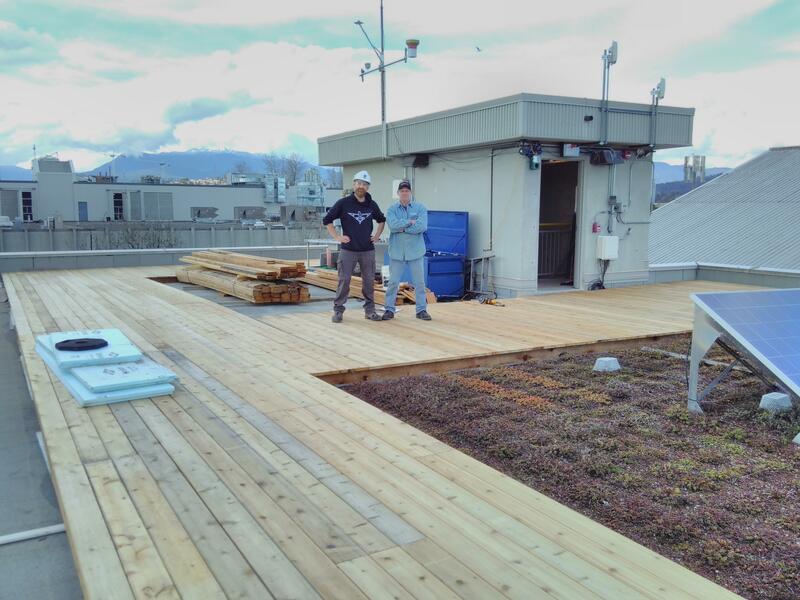 The other, titled ‘Technologies and Ecologies’, marks a new chapter for green roof research in BC. Happy New Year 2019 & Reflecting Back on 2018!